What Is a DMAE Supplement? Saffron is a spice derived from the crocus flower that is native to Southeast Asia. Its orange color and bitter flavor lend a distinct and highly sought after quality to many dishes. The carotenoids that impart its bright orange color have attracted much research interest. Some research has revealed benefits that support the traditional medicinal uses of saffron, including treatment of depression. Extracts of saffron showed anti-depressant effects in laboratory mice in a Chinese study published in the January 2010 "Journal of Natural Medicines." In the study, mice were more active in stressful situations but remained calm under non-stressful situations, indicating a stress-adaptation benefit of the saffron extract. The researchers noted that a particular bioactive compound known as crocin 1 may be responsible for the observed effects and concluded that their results lend support to the traditional use of saffron for treatment of depression. Saffron was as effective as the drug fluoxetine in the treatment of mild-to-moderate depression, according to an Iranian study published in the March 2007 "Progress in Neuropsychopharmacology and Biological Psychiatry." Participants received 15mg of saffron extract twice per day for 8 weeks. A remission rate of 25 percent was obtained in both the saffron extract and fluoxetine groups. However, the researchers reported that side effects were similar for the two groups. Depression associated with premenstrual syndrome responds to treatment with saffron, according to an Iranian study published in the March 2008 "BJOG." In the study, women ages 20 to 45 were given 30mg saffron per day for two menstrual cycles. Effects were measured by subjectively recorded symptom reports and by the Hamilton Depression Rating Scale. Significant reduction in symptoms were noted. 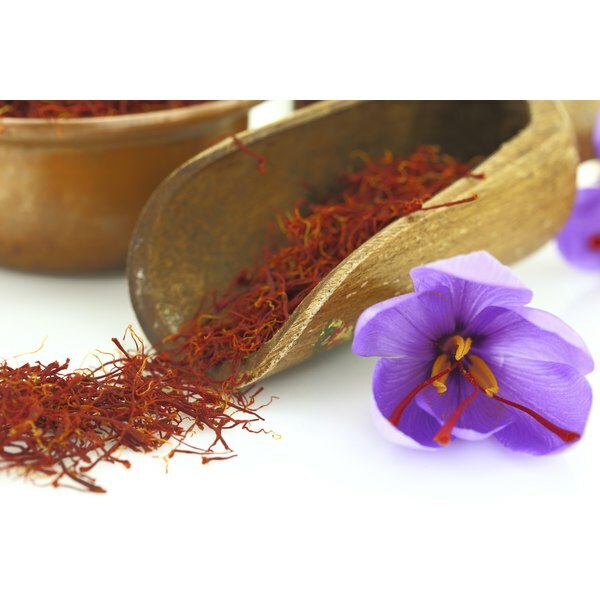 The researchers called for a study on the adverse effects of saffron before it could be confirmed as a viable treatment for depression in PMS. Quality is key to the effectiveness of saffron extract in the treatment of depression, according to a German study published in the June 2008 "Planta Medica." The study found that the extraction methods used in the preparation of saffron determine the concentration of bioactive components in the end product. Bioactive components of saffron have the ability to bind to NMDA, a nerve receptor responsible for learning and memory and implicated in some forms of depression. The bioactive constituents may not be present in saffron products derived from inadequate extraction methods, however.